L'église de la Madeleine (French pronunciation: ​[leɡliːz də la madəlɛn], Madeleine Church; more formally, L'église Sainte-Marie-Madeleine; less formally, just La Madeleine) is a Roman Catholic church occupying a commanding position in the 8th arrondissement of Paris. The Madeleine Church was designed in its present form as a temple to the glory of Napoleon's army. To its south lies the Place de la Concorde, to the east is the Place Vendôme, and to the west Saint-Augustin, Paris. The site of this edifice, centred at the end of rue Royale, a line-of-sight between Gabriel's twin hôtels in the Place de la Concorde, required a suitably monumental end from the time that square was established in 1755, as Place Louis XV. The settlement around the site was called Ville l'Évêque. The site in the suburban faubourg had been annexed to the city of Paris in 1722. Two false starts were made in building a church on this site. The reconstruction of the older church consecrated to Mary Magdalene was considered. The first design, commissioned in 1757, with construction begun with the King's ceremonial placing of the cornerstone, April 3, 1763, was halted in 1764; that first design, by Pierre Contant d'Ivry, was based on Jules Hardouin Mansart’s Late Baroque church of Les Invalides, with a dome surmounting a Latin cross. In 1777, Contant d'Ivry died and was replaced by his pupil Guillaume-Martin Couture, who decided to start anew, razing the incomplete construction, shortening the nave and basing his new, more centralised design on the Roman Pantheon. At the start of the Revolution of 1789, however, only the foundations and the grand portico had been finished; the choir of the former church was demolished in 1797, but work was discontinued while debate simmered as to what purpose the eventual building might serve in Revolutionary France: a library, a public ballroom, and a marketplace were all suggested. In the meantime, the National Assembly was housed in the Palais Bourbon behind a pedimented colonnaded front that was inspired by the completed portico at the far end of the former rue Royale. On 21 January 1815 Louis XVI and his wife's remains were re-buried in the Basilica of Saint-Denis where in 1816 his brother, King Louis XVIII, had a funerary monument erected by Edme Gaulle. In 1806 Napoleon made his decision to erect a memorial, a Temple de la Gloire de la Grande Armée ("Temple to the Glory of the Great Army"); following an elaborate competition with numerous entries and a jury that decided on a design by the architect Claude Étienne de Beaumont (1757–1811), the Emperor trumped all, instead commissioning Pierre-Alexandre Vignon (1763–1828) to build his design on an antique temple (Compare the Maison Carrée, in Nîmes) The then-existing foundations were razed, preserving the standing columns, and work begun anew. 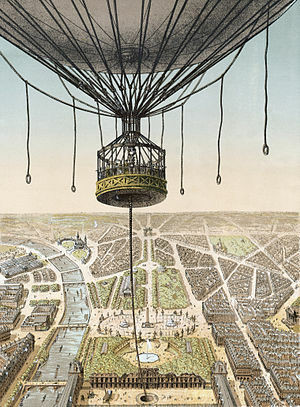 With completion of the Arc de Triomphe du Carrousel in 1808, the original commemorative role for the temple was reduced. After the fall of Napoleon, with the Catholic reaction during the Restoration, King Louis XVIII determined that the structure would be used as a church, dedicated to Mary Magdalene. Vignon died in 1828 before completing the project and was replaced by Jacques-Marie Huvé. A new competition was set up in 1828-29, to determine the design for sculptures for the pediment, a last judgment, in which Mary Magdalene knelt to intercede for the Damned; the winner was Philippe Joseph Henri Lemaire. The July Monarchy rededicated the monument of repentance for Revolution as a monument of national reconciliation, and the nave was vaulted in 1831. In 1837 it was briefly suggested that the building might best be utilised as a railway station, but the building was finally consecrated as a church in 1842. The funeral of Chopin at the Church of the Madeleine in Paris was delayed almost two weeks, until October 30, 1849. Chopin had requested that Mozart's Requiem be sung. The Requiem had major parts for female voices, but the Church of the Madeleine had never permitted female singers in its choir. The Church finally relented, on condition that the female singers remain behind a black velvet curtain. During the Paris Commune of 1871, the curé of the church, Abbé Deguerry was one of those arrested and held hostage by the Commune. He was executed alongside Georges Darboy, the Archbishop of Paris and four other hostages on 24 May, as French government troops were retaking the city. The Madeleine is built in the Neo-Classical style and was inspired by the much smaller Maison Carrée in Nîmes, one of the best-preserved of all Roman temples. It is one of the earliest large neo-classical buildings to imitate the whole external form of a Roman temple, rather than just the portico front. Its fifty-two Corinthian columns, each 20 metres high, are carried around the entire building. The pediment sculpture of the Last Judgement is by Philippe Joseph Henri Lemaire, and the church's bronze doors bear reliefs representing the Ten Commandments. Its size is 354 feet (108 meters) long and 141 feet (43 meters) wide. Inside, the church has a single nave with three domes over wide arched bays, lavishly gilded in a decor inspired as much by Roman baths as by Renaissance artists. At the rear of the church, above the high altar, stands a statue by Charles Marochetti depicting St Mary Magdalene being lifted up by angels which evokes the tradition concerning ecstasy which she entered in her daily prayer while in seclusion. The half-dome above the altar is frescoed by Jules-Claude Ziegler, entitled The History of Christianity, showing the key figures in the Christian religion with — a sign of its Second Empire date — Napoleon occupying centre stage. The Madeleine is a parish of the Archdiocese of Paris. Masses and other religious services are celebrated daily. Funerals and weddings in Paris are still celebrated here. In the basement of the Church (entrance on the Flower Market side) is The Foyer de la Madeleine. Typical of various foyers run by religious and civic groups throughout France, the Madeleine is the home of a restaurant open from Monday to Friday 11:30 am to 2:00 pm except holidays, school vacations and the month of August. For a yearly subscription fee of 5 Euros one can dine under the vaulted ceilings on a three course French meal served by volunteers for the price of 8.50 Euros. After dining one can take coffee in a lounge at the far end of the foyer for one of the cheapest espressos in Paris, 80 centimes. The walls of the Foyer are often decorated by local artists. ^ "Eglise de la Madeleine". Monuments Historique. La Ministère de la Culture. ^ "La Madeleine". aviewoncities.com. Retrieved 23 March 2014. ^ "ÉGLISE DE LA MADELEINE". en.parisinfo.com. Retrieved 23 March 2014. ^ "La Madeleine - Paris, France". sacred-destinations.com. Retrieved 23 March 2014. ^ "Vignon's The Church of La Madeleine". smarthistory.khanacademy.org. Retrieved 23 March 2014. ^ "MadeleineArticle Free Pass". britannica.com. Retrieved 23 March 2014. ^ "EGLISE DE LA MADELEINE". francethisway.com. Retrieved 23 March 2014. ^ "ÉGLISE DE LA MADELEINE REVIEW". fodors.com. Retrieved 23 March 2014. ^ "Place de la Madeleine". lonelyplanet.com. Retrieved 23 March 2014. ^ Louis Vierne: Organist of Notre-Dame Cathedral. /books.google.com.np. Retrieved 23 March 2014. ^ "The Cavaille-Coll organ of La Madeleine, Paris". signumrecords.com. Retrieved 23 March 2014. ^ "Appendix J Parisian Organists - A Directory of Composers for" (PDF). rscm.u-net.com. Archived from the original (PDF) on 10 March 2013. Retrieved 23 March 2014. 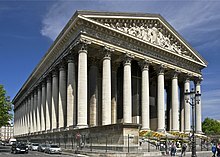 Wikimedia Commons has media related to Église de la Madeleine (Paris).